Oasis in the Caribbean in Palmares de Caleta. Property 5: Oasis in the Caribbean in Palmares de Caleta. Property 13: LOCATION, LOCATION! Close to boutiques, bars, restaurants and supermarket. 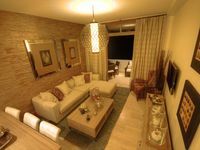 Apartment in Cadaques Caribe Resort. Property 18: Apartment in Cadaques Caribe Resort. Property 19: Dog-friendly condo w/ shared pool, 5-minute walk to the beach! Exotic apt. w/shared pool, near the beach and close to adventures! Property 26: Exotic apt. w/shared pool, near the beach and close to adventures! Front of Caribbean Sea, beautiful apart. with pools & direct access to sea. Property 31: Front of Caribbean Sea, beautiful apart. with pools & direct access to sea. ★ Modern PH w/jacuzzi, ocean and golf views, BBQ & telescope. Walk to beach! Property 42: ★ Modern PH w/jacuzzi, ocean and golf views, BBQ & telescope. Walk to beach! Location and facilities are really nice, pool is cool. Don&rsquo;t like check out time as It said 12:00pm but during check in told me was 11:00am. Kitchen should be more equipped. I strongly disagree on electricity extra charge, that should be included in price. Pictures should reflect the apartment you are reserving, that was not the case.